Summer Safari is the Metro Richmond Zoo’s summer camp for children. Each camper gets an exciting behind-the-scenes look at many animals such as the rhinos, cheetah, and penguins. The camp includes a tour of the Zoo led by a Zookeeper and an assistant. Junior Summer Safari is for children ages 6-9, and is a 4 hour day camp. Senior Summer Safari is for children ages 10-13, and is a 6 hour day camp. Campers must bring their own lunches. Bring large water bottles filled with cold water. *Children up to 13 may attend, but the program is structured for 6-9 year olds. There is a discount on the Junior Explorer Course if the children and parents wish to participate after the summer safari camp. The discount is 20% off and is only available for immediate participation at 1:30 pm on the day of your camp visit. Unlike the senior summer safari group, this program is not facilitated by the camp. Thus, the same rules and restrictions for chaperones on the Junior Course pertain. 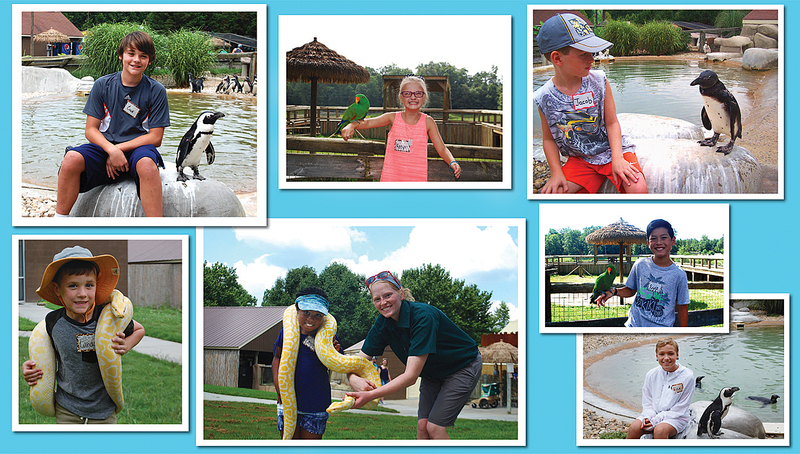 * If your child has a 2019 zoo membership they will receive a discount on their day camp. (5% off for silver members and 10% off for gold and gold+ members) To receive the discount please call the Zoo at 804-739-5666 to book over the phone or book at the zoo. * Group discount! Junior Summer Safari costs $50 per camper when you register 3 or more kids in the same transaction. This program’s activities are structured for children ages 10-13. No children under 10 will be admitted. * Group discount! Senior Summer Safari costs $70 per camper when you register 3 or more kids in the same transaction. Take a picture with your favorite animal! Registration is available online, over the phone with a credit card, or in person. Due to the popularity of this program, dates will not be held until payment is received. Registration and Emergency forms MUST be on file before camper can participate. This is a camp for children. Parents and chaperones are not allowed to participate and/or follow the group around the zoo. Completion of the Permission and Medical Release form immediately upon purchase of camp. Declaring that your child is physically and mentally able to participate in this camp that is away from his/her parents. **Parents/guardians are not allowed to walk with nor follow the group throughout the zoo during the SUMMER SAFARI. This is distracting to the group and interrupts the teaching activity for all the campers. The Metro Richmond Zoo reserves the right to cancel any Summer Safari program. Participants will be notified by phone call or email. In the event of cancellation by the Metro Richmond Zoo, you may reschedule to another available Summer Safari date or request a full refund. Since all activities take place outdoors, cancellation may occur in the event of inclement weather. In the event of campers who cancel their Summer Safari date or “do not show” without prior notification, a refund will not be given.